Pork CRC offers the innovative AusScan technology developed to rigorously assess grain quality before feeding livestock. With various environmental factors causing damage to grain produced across Australia, livestock producers, particularly pig farmers are turning to AusScan, a new technology commercialised by Australia’s Pork Cooperative Research Centre (CRC) to assess grain quality. Pork CRC AusScan Project Manager, John Spragg says he is confident that available energy determinations for weather damaged grains using the AusScan near infrared (NIR) calibrations would provide more meaningful data than that generated from the metabolisable energy (ME) estimation equations. He adds that the difficulty with field samples lies in not having a control non-weather damaged grain for comparison, whereas the Premium Grains for Livestock Program (PGLP) artificially created weather damage by germinating grains and stopping germination at various stages via rapid drying. The PGLP dataset includes weather damaged field samples. Established in 1996 as a jointly funded grains and animal industries project, PGLP was a result of the rapidly increasing demand for grain by intensive livestock industries combined with concern about a reliable supply of grain meeting their particular quality specifications. Original PGLP data demonstrated that weather damage could provide inconsistent effects on ME with variable energy content in the grains during different stages of germination. Mr Spragg warned that livestock producers needed to be aware of mycotoxins that may develop in weather damaged grain. He added that it was essential to ensure the grain was fully dry before storing weather damaged grain. He explained that AusScan cattle ME and sheep ME calibrations were from in-vivo feed and were not estimates based on chemical composition. Mr Spragg adds that they are confident their available energy determinations for weather damaged grains using AusScan NIR calibrations will provide more meaningful data than that from ME estimation equations. The calibrations also included small, lightweight grains with higher screenings. Commercial grain testing laboratories now have the AusScan NIR calibrations, so producers need to specify that they want an AusScan analysis. 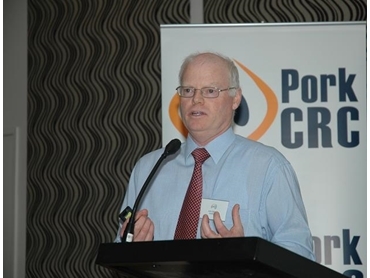 While the Pork CRC, on behalf of the livestock industry has actively promoted use of the AusScan technology, Mr Spragg says that the past year was one in which the technology revealed its true worth due to the large variance in grain quality in the market.